Thomas Cole is one of many early Victorian glove manufacturers in Yeovil but unfortunately very little is known about him. He was born in Yeovil around 1808, the son of carpenter and wheelwright Thomas Cole (d 1838) and the first mention of him in the records is when he was listed as a glove manufacturer of Kingston in Pigot's Directory of 1830. He was listed in the Poll Book of 1834 by virtue of living in, and owning, a freehold house in Mudford Road. He was listed as Thomas Cole Jnr, confirming his father's name. He was listed as a glove manufacturer in a deed dated 1835 and was listed as a glove manufacturer of South Street in the Somerset Gazette Directory of 1840. Thomas was a member of Yeovil's Vestry and also served as a Churchwarden of St John's church in 1844 and 1845. Thomas was listed in the 1841 census living in Mudford Road with his wife Ann and children Harriet (b 1834), Thomas (b 1835) and Mary (b 1837). Thomas' occupation was written as 'Glove M' indicating he was a glove manufacturer rather than a simple glover. Thomas was listed in the Poll Book once more, in 1846, again by virtue of living in, and owning, a freehold house in Mudford Road. In fact the 1846 Tithe Apportionment shows that Thomas Cole owned all the land and buildings along Mudford Road from Higher Kingston as far as Sparrow Lane (today's Sparrow Road). The Churchwardens' accounts of St John's church noted him as an insurance agent in 1847 and in Hunt & Co's Directory of 1850 he was listed twice; firstly as a glove manufacturer of Hendford and also as an agent for the Yorkshire Fire & Life Insurance Co. of Hendford. By the time of the 1851 census Thomas and Ann (who, it transpires, came from Harthill, Yorkshire) were living in Hendford with their children 17-year old Henrietta and 7-year old Edward. Thomas listed his occupation as "Glove Manufacturer employing 16 men, 14 boys, 320 women partially". In fact that part of Hendford in which Thomas lived with his family was what today we call Princes Street. His actual house is difficult to pinpoint - in the census before him is banker John Ryall Mayo of Old Sarum House on the west side of the road, then solicitor Henry Marsh Watts who lived in Glenthorne House on the east side. In the census after him is affluent merchant John Glyde Jnr of Wyndham House on the west side. Between Old Sarum House and Wyndham House is Bryndene (not listed in the census ?) but this was the home of the Fooks family between 1806 and 1919. It must be assumed, therefore, that Thomas Cole's house was on the east side of the road, south of Glenthorne House, and opposite Bryndene - today the site is occupied by the relatively new building of Walter Wall Carpets. Slater's Directory of 1852 gave Thomas three listings, all in Princes Street, as a glove manufacturer and as an agent for the Yorkshire Fire & Life Insurance Co. and also agent for the London & Provincial Fire & Life Insurance Co. 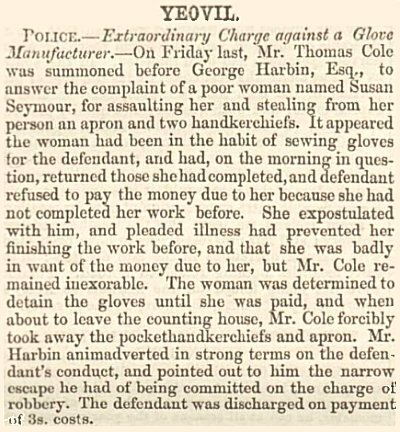 He also had a scrape with the law in 1852 and landed in court accused of assaulting a woman and stealing from her - full report below. Unfortunately Thomas Cole and his family seem to disappear from the records after this date. Thomas Cole's signature against the Vestry minutes of 5 April 1832. A report from the 18 September 1852 edition of the Wells Journal describing the case against Thomas Cole who appears to have had a somewhat unpleasant character. 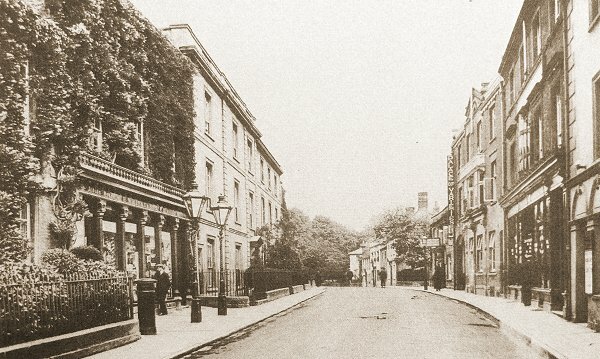 A photograph of the northern end of Princes Street dating to around 1900. At right, at this time the Assembly Rooms were known as the 'Palace of Varieties' as indicated by the vertical sign attached to it. It is likely that Thomas Cole's residence was the two-storey building to its immediate left in the photograph. The three impressive three-storey residences at left, beyond Whitby's ivy-clad shop, are Wyndham House, Bryndene and Old Sarum House.